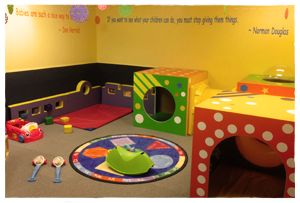 The Tot Spot provides an area specifically for toddler–3 year old play. This exhibit space follows the toddler philosophy “It’s all about me!” and is filled with age-appropriate toys and activities specially chosen for the development of the youngest minds. Lower furniture, mirrored and textured walls, and mats for crawling are some of the features that encourage exploration in this toddler area.